Subtle yet important, the interactions between motor neurons with neighboring cell types contribute to the pathologies of ALS (or Lou Gehrig’s disease), specifically motor neuron death. Reported in Proceedings of the National Academy of Sciences, mutations to a gene called TDP-43, although rare, cause astrocyte cell death. 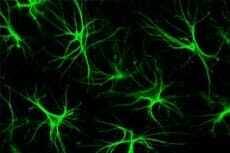 While astrocyte cell death is associated with motor neuron death, they are not directly toxic. Siddharthan Chardan, who led the study, generated induced pluripotent stem cells from ALS patients to make this discovery.